Wannemaker’s Home and Garden founder William Wannemaker (1926 – 2005) had a passion for family, business and hard work. He was an Air Force tail gunner for B-17 and B-29 bombers in World War II. He was a well digger with his father. Through it all, he carried the importance of hard work. William married Ruth Gee, and started a family. Soon afterward, William went to work for his father-in-law, Teddy at Gee Lumber and Hardware. Then, in the early 1960s, William helped found the E.G. Home Center stores in Carol Stream and Downers Grove. William set out on his own and bought Tollgate Nursery, a small nursery and gift shop on Ogden Avenue in Downers Grove. Four years later, it would become Wannemaker’s Home and Garden. 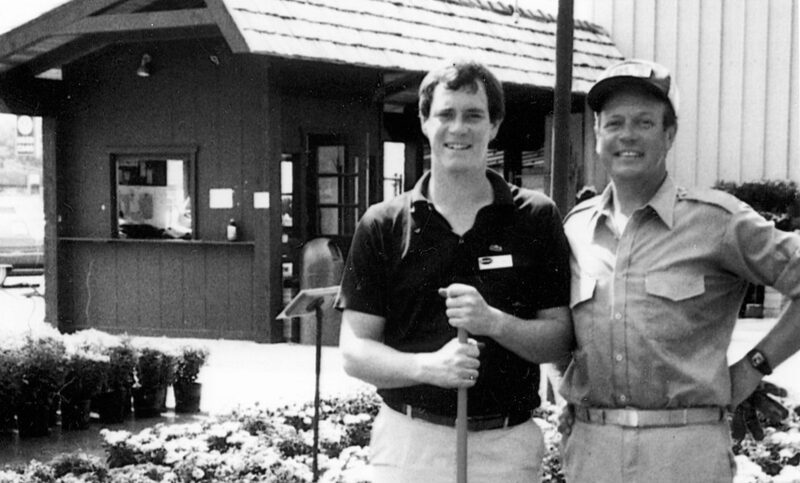 With the help of his two sons, Jim and Bob, he turned the business into a complete home center. With the family’s dedication to the community and its people, Wannemaker’s quickly became a must stop shop in the Western Suburbs. In the mid 90’s, we switched gears. You will no longer find lumber, hardware or paint supplies at Wannemaker’s. Instead, we offer outdoor gardening, high end patio furniture and seasonal gifts and decor. It was William’s keen business instincts that helped him develop and implement strong strategies to adapt to a changing industry. Jim and Bob continued their father’s vision and dedication into the 21st century while picking his brain to understand the intricacies of retail. William instilled the importance of family in Jim and Bob and watched as they both built happy families while running the business. William was proud to hold the title Grandpa Bill to his 11 grandkids. The 3rd generation of Wannemakers carry on the tradition of excellent selection and service. Jim’s daughters and son, Kristen, Joe, Kelly, and Jennifer, are extremely eager to strengthen the business built by the generations before them. Wannemakers endures as a perennial neighborhood favorite. And you’re a part of our history. Our past, present, and future are all thanks to your support, and we will always be proud to serve you.